Playa del Carmen, Mexico is for the Adventurer- If you're searching for world-class diving and unique opportunities for adventure, you only need to look as far as Mexico. Playa del Carmen, Mexico is a coastal resort along the Caribbean. Not only does Playa del Carmen host spectacular sandy beaches with palm trees, but it is also close to Mayan ruins, and it is a premier dive spot. If this sounds like your kind of vacation, don't wait to rent a beach house and reserve your spot for your ideal getaway. Learn more here! Playa del Carmen, Mexico is for the Adventurer- If you're searching for world-class diving and unique opportunities for adventure, you only need to look as far as Mexico. Playa del Carmen, Mexico is a coastal resort along the Caribbean. Not only does Playa del Carmen host spectacular sandy beaches with palm trees, but it is also close to Mayan ruins, and it is a premier dive spot. If this sounds like your kind of vacation, don't wait to rent a beach house and reserve your spot for your ideal getaway. One of the most popular things among Playa del Carmen visitors is to explore the Mayan ruins. While the ruins are about two hours from Playa del Carmen beach houses, this unique opportunity is not to be missed. There are several companies that offer tours of the Mayan architecture, complete with a taste of Mayan cuisine, for travelers of any age. Tours will likely visit Chichen Itza - one of the largest Mayan cities - and the Sacred Cenote. This "Well of Sacrifices" made Chichen Itza a true cultural center where travelers from across Central America met to worship the gods and offer sacrifices at the well. Many artifacts, including weapons, idols, pottery, tools, and jewelry, have been dredged from the well, showing the diversity of the people who once stopped here. If you are an avid diver, you probably already know about Playa del Carmen, since it is considered to be one of the best diving spots in the Western Hemisphere. If you are new to the dive scene, then there are a few things you'll want to know. 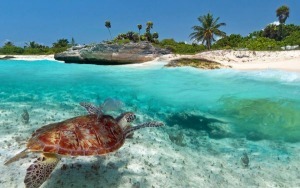 Playa del Carmen is near Cozumel, which is a world famous scuba diving destination. Caribbean reefs are abundant in this region, providing a place for many species of sea life to flourish. As you dive in these spectacularly clear and warm waters, you will likely see rays, moray eels, sea turtles, coral, tropical fish, nurse sharks, and many more natural wonders. For the advanced diving adventurer, dive trips are available for local cenotes and caverns. Whether you are new to diving, or if you are a certified pro, you can find a dive experience that is perfect for you. And since there are many dive tour and rental companies to choose from, you won't have to worry about lugging your gear to and from your Playa del Carmen beach house rental. To really experience Playa del Carmen like a local, you will want to visit Quinta Avenida (5th Avenue). This pedestrian walkway lies a few blocks inland of the beach. While it is a hotspot for tourism due to the many shops, restaurants, and bars, it is also the center of the nightlife scene for the locals. Quinta Avenida is the vibrant pulse of Playa del Carmen, and you can't say you've really experienced this resort town until you have spent some time soaking in the culture here. Shopping can be especially fun, since haggling is not only welcome, but expected. You can find anything on Quinta Avenida, from shops with the perfect souvenirs to salons that offer fish pedicures;where "doctor fish" nibble the dead skin from your feet! Casa Mediterranea is a well-regarded restaurant along this walkway, serving Italian and Mediterranean cuisine. If you stop here, get a pasta dish - they earn rave reviews for their pasta that is made in house. 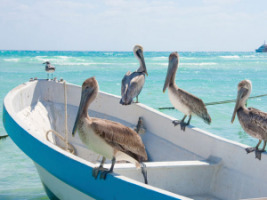 If you have the heart of an adventurer, Playa del Carmen is calling your name. Book your beach house in Playa del Carmen and get ready for non-stop excitement and memorable moments!